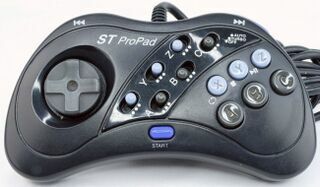 The ST ProPad is a third-party controller for the Sega Saturn created by Recoton's STD Manufacturing division and sold under the InterAct name. It is a simple controller with turbo switches. The ST ProPad is one of the more common third-party controllers. It was sold as the Game Pad by Electronics Boutique, Quantum by Wild Things and under the Turbo Pad Control brand by Dynacom in Brazil. It also appears to have inspired the Odyssey by Phase 9.